The Memorial is open every day except Christmas Day and New Years Day, as follows: Winter (1 November - 31 January) Weekdays: 08.00 - 16.00 hours Weekends & Public Holidays: 10.00 - 16.00 hours Summer (1 February - 31 October) Weekdays: 08.00 - 18.00 hours Weekends & Public Holidays: 10.00 - 18.00 hours This Memorial overlooks the River Thames on Cooper's Hill at Englefield Green between Windsor and Egham on the A308, 4 miles from Windsor. 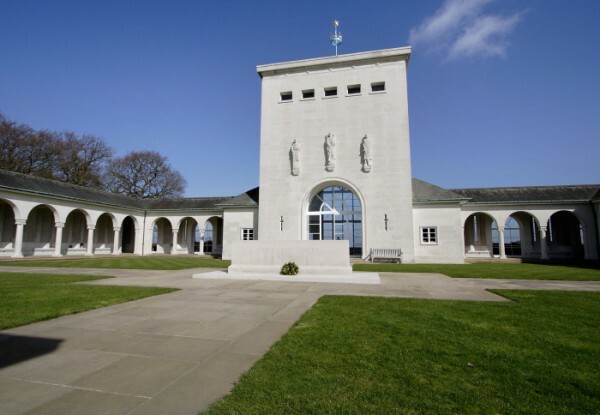 The Air Forces Memorial at Runnymede commemorates by name over 20,000 airmen who were lost in the Second World War during operations from bases in the United Kingdom and North and Western Europe, and who have no known graves. They served in Bomber, Fighter, Coastal, Transport, Flying Training and Maintenance Commands, and came from all parts of the Commonwealth. Some were from countries in continental Europe which had been overrun but whose airmen continued to fight in the ranks of the Royal Air Force. The memorial was designed by Sir Edward Maufe with sculpture by Vernon Hill. The engraved glass and painted ceilings were designed by John Hutton and the poem engraved on the gallery window was written by Paul H Scott. 60 airmen from the 1,531 servicemen lost with HMS Glorious, HMS Ardent and HMS Acasta are remembered at the Runnymede Memorial.